Experience the most magnificent and historic 478 acres in New York City. Join our expert tour guides to hear fascinating stories of Green-Wood’s permanent residents, see breathtaking views of Manhattan, tread where George Washington and his troops fought the Battle of Brooklyn, and much more (scroll down for schedule of different themed tours available). $15 for members of Green-Wood. / $20 for non-members. Seating is limited. Trolley tours routinely sell out. We strongly suggest that you reserve tickets in advance to ensure a spot for your preferred day! 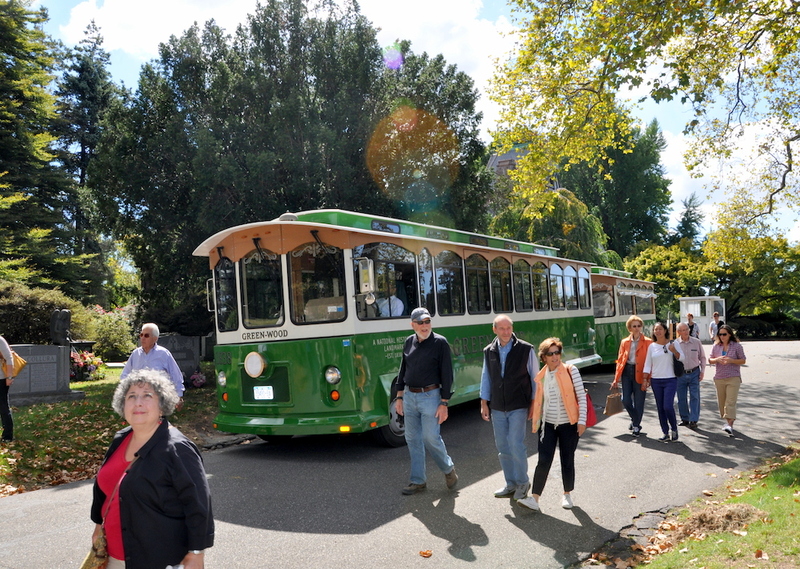 Green-Wood trolley tours are fully accessible and ADA compliant. In order to accommodate a wheelchair or other mobility aids on the trolley, arrangements must be made in advance. Please call (718) 210-3080, ext. 1. Please note that portions of the tour take place outside the trolley, however attendees may stay seated in the trolley if they wish. Please contact the Historic Fund for more information.